This is an aristocratic residence built in a scenic position, elegant in both its painted decorations and architectural space. The conventional name derives from the geometric black-and-white mosaic, with a checkerboard motif in the atrium, while the vestibule is inspired by the coffered ceilings. The ancient tablinum, aligned with the entrance, was converted into a hall with three naves, similar to a basilica (oecus Aegyptius), a room of extraordinary architectural significance that represents the only known example thus far discovered throughout the Vesuvian area. 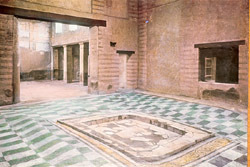 The garden, with its marble-covered fountain, is surrounded on three sides by porticos, and a windowed veranda on the north side: its floor is of sectile opus and the walls bear figurative ‘fourth style’ paintings, as in the rest of the house.